These are excellent. Lovely work. Looks like a great week for both the teacher AND the students! It sure was Sue. Great in every way. I was very eager to see your paintings in Savannah! I left there the same day you arrived. 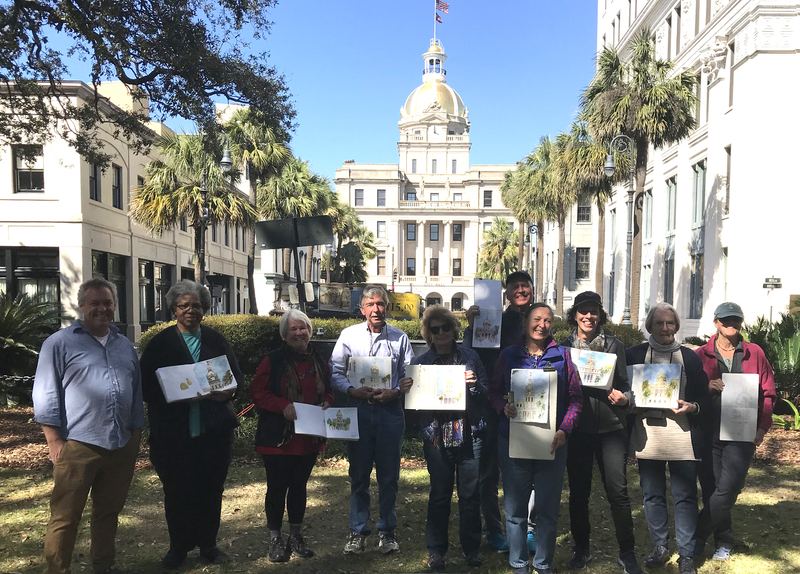 Savannah historic centre is a favourite memory and your work fills me with joy—especially the azalea painting and the city hall. hide people starting their escape. on preorder.). 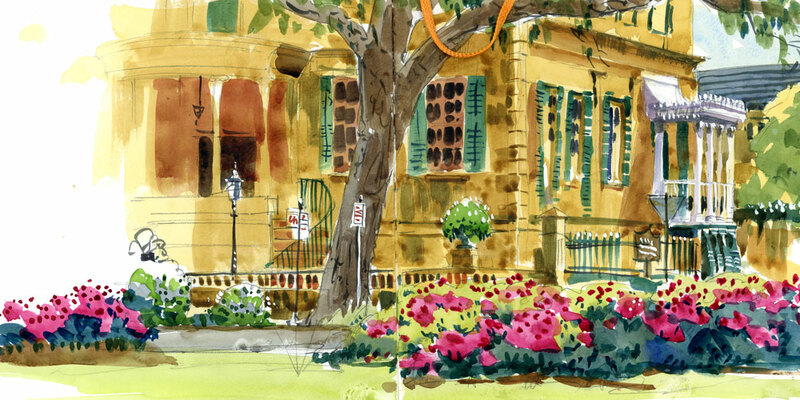 Many thanks for sharing the colours and scenes of Savannah today! Hi Jean. Yes, the church is very important in the history of the Underground Railway. Of course I can make you prints of any of the sketches you see. You can email me at sblaukopf@gmail.com, and I will send you prices. You can let me know which of the images you would like as a print. 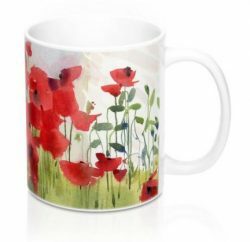 I create the prints on demand so I can make pretty much anything you want. Those three days were the highlight of my life, I learned so much from all, especially to Shari, you are such a great teacher, I feel very fortunate to be able to join your workshop, without it I could be sticking to those awful water brushes! 😉 LoL! 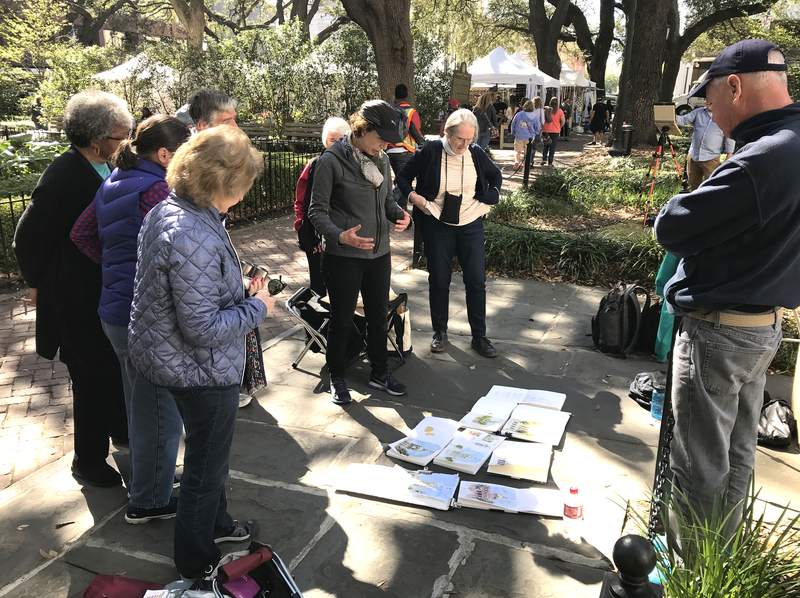 Shari, please come to Savannah to teach every year! Chris, it was great to meet you and such a pleasure to see your work, especially after you started using the good brushes! I would gladly come back to Savannah every year. I still haven’t sketched in all the squares, so we could sketch them together. Glad you made it home safely. 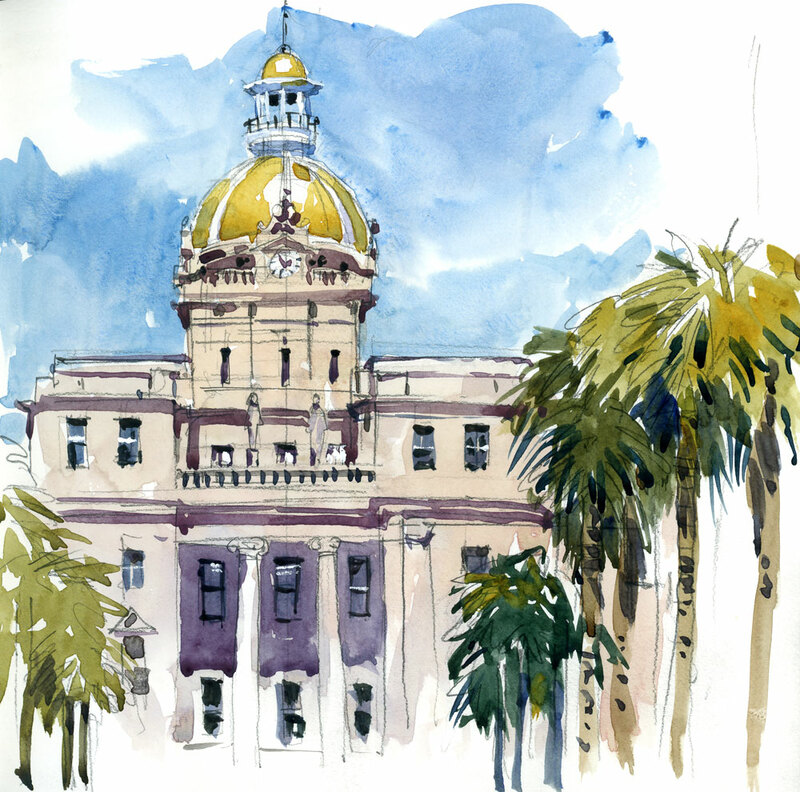 You really got a lot of sketching done in Savannah. It is one of my favorite cities and has such great views wherever you look. I love the one of the Owens-Thomas House and the one looking down East Jones Street the best. This looks like a workshop I would have loved to be a part of…and my friend, Lin was there in the group. Maybe next time! Joan, I was very happy to meet Lin. 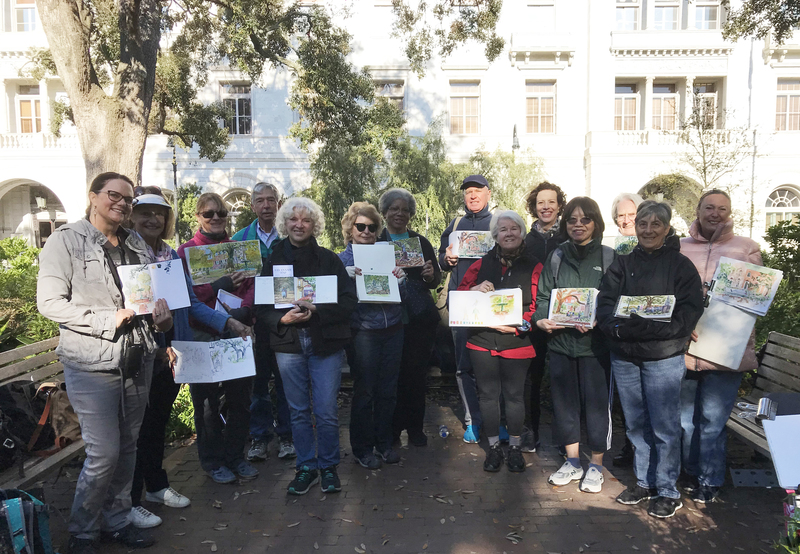 It was a wonderful group, lots of fun, so much to sketch. Perhaps one of these days you’ll be able to join us. That’s a terrific wrap-up of what was clearly a special week. I love how you captured the good dome, and all the magic of the squares, etc. I hope there will be more workshops in Savannah. Alison, it was a fantastic week in every way. I would repeat this every year if I could. So much fun to sketch there. I just love all those beautiful sketches on the last day. Everyone looks so happy. Thank you for your skill, patience and time. It was a wonderful experience in a fantastic city. April, it was wonderful to have you in the group. Hope you made it home safely and hope you come home from your travels with a big fat book of gorgeous sketches. That sounds all so exciting. I will probably be in Savannah next year anytime between March 8-14. I so hope that you will teach your workshop again next year so that I finally can take a workshop with you! 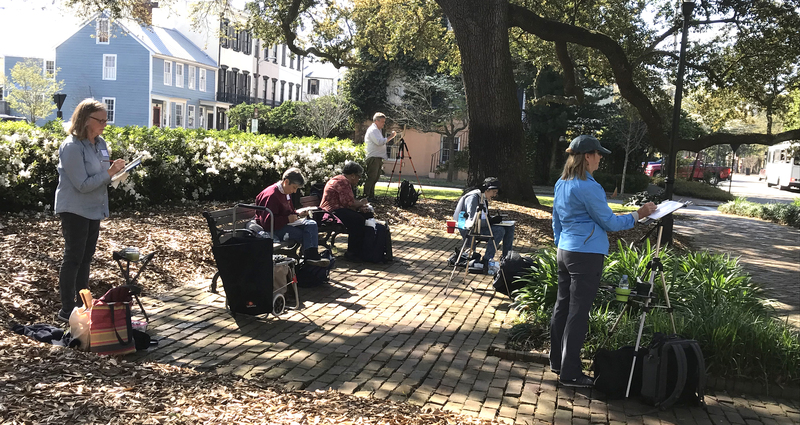 Edda, I would certainly love to give another workshop in Savannah. Keep an eye on my blog and watch for updates. Are you on my mailing list? If not, I can certainly add you. Really enjoyed reading this and seeing the paintings. They are wonderful. Your narratives and pictures from your workshops could fill another book. Thanks Judy. So glad you enjoyed the post! Sasala, I am looking forward to sketching with you in Amersfoort too! beautiful, are these colored pencil or watercolor ? Thanks Linda. These are watercolour. Thanks so much Shruti. Looking forward to meeting you in Chicago. 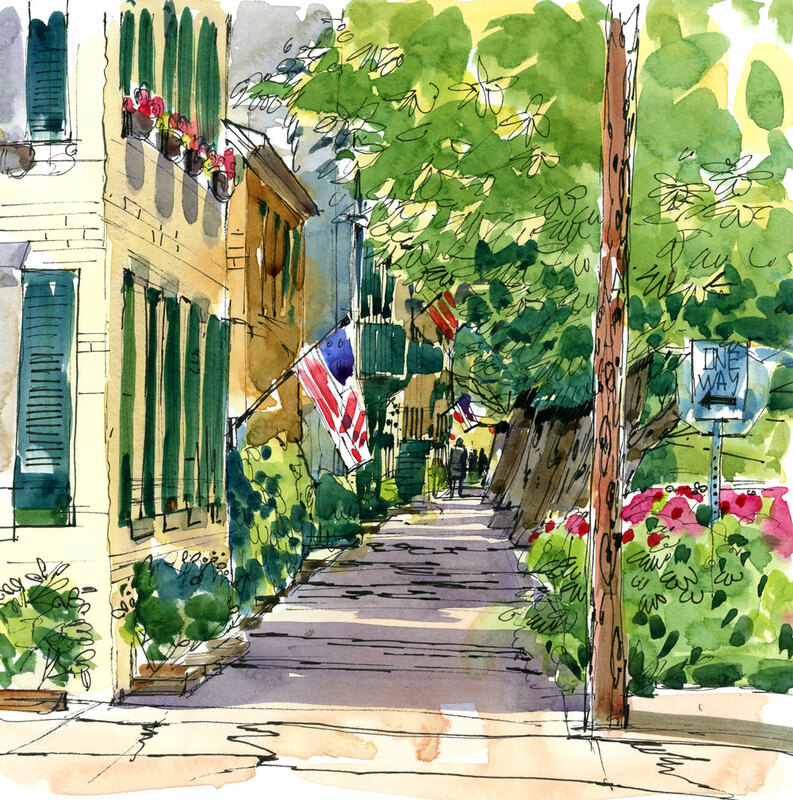 Beautiful sketches Shari, Savannah is one of the cities I would love to sketch. You inspire me to visit it and sketch it sooner than later! Adriana, how great to hear from you. 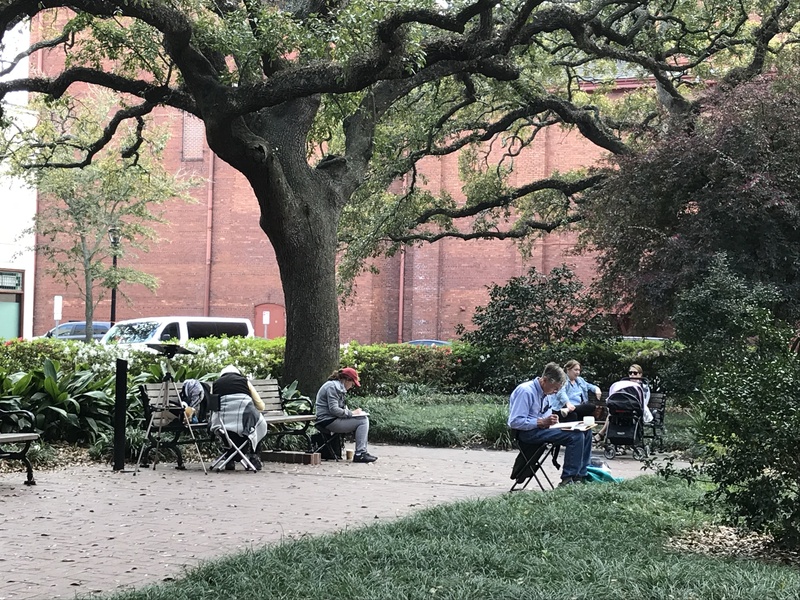 Savannah is one of the best cities to sketch. Go there if you can. You will love it! You did a beautiful set of sketches in what appears to be a beautiful location. I can easily see reproducing them as notecards or as illustrations for a guidebook. Thanks! Kirk, I was thinking the same thing. 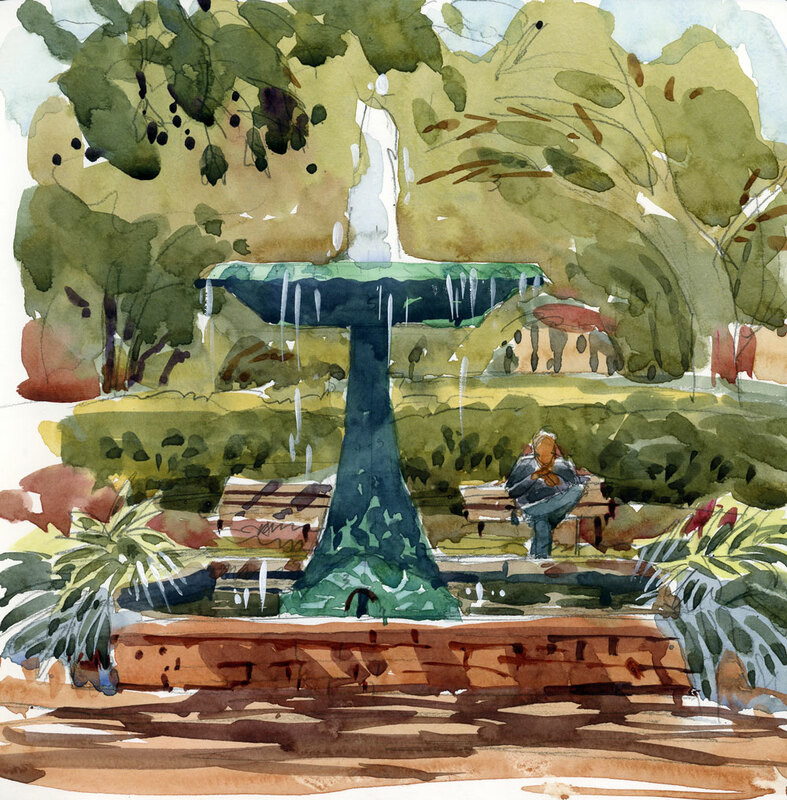 I have so many sketches of Savannah now that I could really do a guidebook. Shari , I also love, love, love your colors and scenes! They make me feel good just looking at them and your style is unique. Thank you for a beautiful article! And thank you for writing! Much appreciated.